Great pedal for all metal genres, other players - beware! 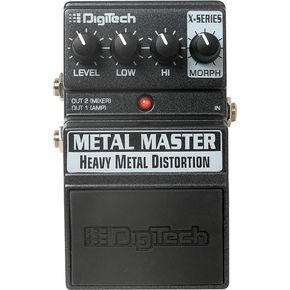 The Digitech Metal Master distortion pedal is housed in what musicians usually think as the standard stomp box – a sturdy metal box with dark gray, almost black color. The pedal has the following controls – level (controls output level), eq section comprised of low and high control knobs which control the bass and highs respectively, and Morph. The Morph control is where things get interesting. It provides 3 types of distortion and you can blend in 2 types at a time. On the far left you have a smooth lead tone, at 12 o’clock position you’d find a scooped midrange sound and at the far right is a midrange heavy sound. Adjacent sounds can be blended, so distortion one (lead) can be blended with distortion 2 (scooped) by moving the dial from left to right. Once you pass the 12 o’clock dial position you can blend between distortion 2 (scooped) and distortion 3 (punchy mid sound). Having these distortion options on a rotary pot essentially makes impossible to blend in distortion #1 with distortion #3, so only adjacent distortion sounds can be blended. The pedal can be powered via a 9 volt battery, housed under the rubber padded on/off switch or a 9 volt adapter, which is not supplied, but can be ordered through the company or any Digitech dealer (Digitech part # PS200). The battery can be swapped by a cleverly designed spring loaded hinges that release the top part by pressing either side of the pins with a ¼ jack socket. The battery is easy to replace and a ¼ inch jack is something musicians will always have handy because of the guitar cables plugged into the effects unit. The guitar input is on the right of the unit (standard ¼ inch socket) and on the left one can find two ¼ socket outputs – one is speaker emulated direct output and the other is a guitar amp output. The speaker emulated output can be fed into PA mixer or directly into a computer recording interface. Upon testing I was surprised that this pedal has an unlimited amount of GAIN – there is almost too much of it!!! Seriously, most of the time when one reviews distortion units the main complaint is that there is not enough gain to achieve a grinding brutal metal tone. Well, this pedal has metal written all over it! My complaint with this implementation is the lack of gain control pot so that guitarists can turn down the gain slightly from the pedal for more clarity for rhythm sounds. This can be achieved by using the guitar’s volume control but most stock guitars suffer treble loss when not at full volume so that could be a problem for some players, but considering that this unit is mainly for the metal crowd I don't see that as a huge setback. Some of the guitars that I plugged into the Metal Master were imparted with too much personality by the pedal. What I mean by this is that this box definitely takes over the sound and robs some of the expensive guitars of their tonal nuances. On my Music Man, for example, it was almost indiscernible whether I had selected the bridge or middle pickups, or a single coil or humbucker. The Metal Master sounded best with “Morph” set somewhere in between 1 and 3 o’clock. With this setting and my Music Man guitar running into a clean setting on my Marshall JCM900 I got a sound very close to Exodus’ last few albums. The eq responded very well to the touch as it wasn’t overly precise yet focused enough to help achieve the desired tones. I think this unit could use a mid control as I felt drowned out by another guitarist in a live setting and had to dial more mid through the PA. The Metal Master can also get some very good metal lead tones with Morph at about 9 o’clock but I felt that some of these sounded overcooked and lacked some mid-range clarity. I was able to achieve a slightly tighter, more focused sound on a humbucker guitar. The midrange livened up a bit more and the sound got a bit more focused when playing through my Kramer Flying V equipped with a Dimarzio X2N pickups. This pedal delivers sounds that will keep most extreme metal heads happy for a long time. The Metal Master unleashes sonic mayhem to the unsuspecting masses, whether it is thrash, speed, black, metalcore or any other metal subgenre. It is definitely not for the faint-hearted, as it might prove quite a beast to tame! From all the pedals tested, the Metal Master was probably the least picky on guitar quality and amps used. It sounded good on whatever equipment it was used on, whether it was cheap solid state amps or expensive tube gear. As an extra feature Digitech also has the amp simulated Line out which can feed a PA or recorder directly and is a great idea for those musicians who want to skip lugging amps to gigs or those of us who like to practice late at night with headphones. Digitech confirmed that the amp simulation is always on so what this does is effectively make the Metal Master the pedal to plug all your other pedals to when you want to record or rehearse with amp simulation, something very handy for those night sessions where a blasting amp might get you in trouble.